This tutorial will show how XDV can be implemented on your Plone site with the assistance of Internet Information Services (IIS) and Enfold Proxy. See also: XDV Reference and Using EP with XDV Themes for more advanced configurations. Create a directory on the Windows file system that will contain your XDV files. This can go underneath the root directory of one of your IIS websites or be entirely separate from it. Add some test XDV configuration files to this directory. With IIS configure a Virtual Directory which points to the directory with your XDV files. Open Enfold Proxy and select the proxy definition which will be themed with your XDV files. Go to the Excludes tab for this proxy definition and type the name of your IIS virtual directory in the Excludes regex field. Manually edit the eep.ini file (the EP configuration file found inside the Enfold Proxy install directory). You will add special instructions for the proxy definition which will use XDV. Test the web page in the browser to make sure the page uses the XDV theme. First we need to configure IIS to serve static resources for our XDV theme. This directory will contain our theme and its associated static resources, e.g., C:\xdv-theme and C:\xdv-theme\static respectively. Create three empty files to get started: C:\xdv-theme\rules.xml, C:\xdv-theme\theme.html, and C:\xdv-theme\static\styles.css. (These instructions are specific to IIS 6. The instructions are slightly different in IIS 7). Suppose we want Default Web Site to be the site using XDV. You will see the virtual directory creation wizard. Click the next button. Select an alias, (such as "static") and click the next button. At this point you will need to browse to the directory corresponding to where you put the XDV files (in our case, C:\xdv-theme\static. Click Next and then finish. Launch the Enfold Proxy configuration utility and select the proxy definition/IIS site that you wish to theme. Select Excludes. You can either select All in the Auto-excludes field or type the name of the alias you used (in this case, static) into the Excludes regex field. Click Save and exit Enfold Proxy configuration tool. Believe it or not, that's a complete (but very basic) Plone theme using XDV. We now have an HTML file which serves as the base of our design, as well as a rules file that does the transform. Not particularly visually exciting, is it? But what you have just set up is a very powerful way to theme Plone sites that makes it possible to use any pre-existing design with a Plone back-end. The reason that this is exciting is that you're using your own HTML and CSS, not modifying Plone's HTML and CSS. A high-level overview of what is going on in XDV. 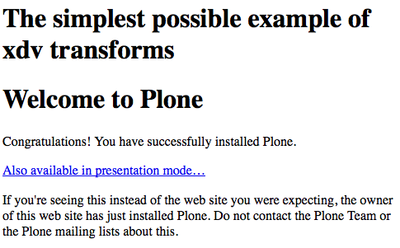 The main difference is that you're not touching the templates and HTML from Plone itself at all. Instead, you create the layout and design you want in standalone HTML and CSS files and map parts of the content that comes out of Plone into your existing HTML. This means that you can create as complex (or simple!) 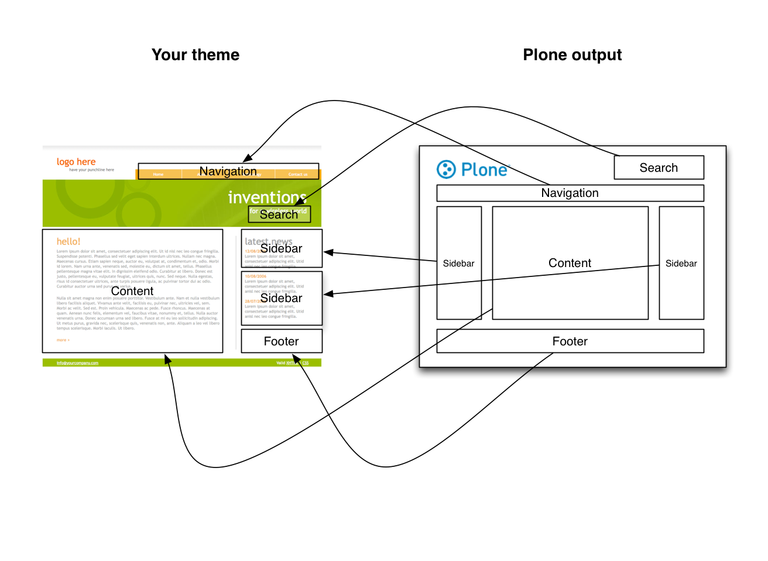 designs as you want, and let Plone supply the content. This also means that you can write your own from-scratch HTML and CSS, but also map various Plone elements to wherever you want in your own design. Plone knows nothing about what happens "on the way out", it just renders a page as it usually does. This makes for a much more robust approach to theming, because as long as Plone keeps its HTML classes and IDs the same from one version to the next, your theme will automatically work even in a new version of Plone. And if it has changed, it's a relatively simple operation to update the theme - just locate the new name, and replace it in the rule file. It looks at the Plone side of things ("content"), and locates the part of the HTML that has id="content". It then replaces the part of your theme's HTML that has id="my-content-area" with the content it got from Plone. The syntax (inside the content and theme attributes) can be a bit intimidating - luckily we have great tools to make it very easy to get this right. The syntax is called XPath, and is a standard for addressing nodes in the DOM, and it's also directly supported in Firebug. A full treatment of how Firebug works is out of scope for this tutorial, but the Firebug online documentation should explain how to install it and use it in Firefox. That is the XPath expression that uniquely identifies that part of the page. You probably recognize this from our original rules.xml file. That's the node that you're looking for in the Plone source, and you use the same approach to find the node you want to replace in your theme.html file. You don't have to teach yourself XPath - just arm yourself with Firebug, and make use of its built-in support for these expressions. Four rules are all you need to theme a site. Luckily, what goes in a rule file is simple - there are only four types of rules, and they are easy to understand. Replaces an element in the theme with content from the site. The XPath expressions are actually pretty straightforward when you know exactly where the elements are. You'll get used to the most common variations after using Firebug's Copy XPath a few times. Also note how the entire specified tag is replaced, nothing from the theme file remains. Adds the content from the site to the theme, either before or after the specified element. Notice how we take the all of the <script> and <style> tags from Plone, and append them after the current content of the head tag in the theme. This way, you can let Plone manage some of your CSS and JS if you want - useful for conditional includes. This way, the second rule doesn't overwrite the first - it appends the second column, so both appear inside the id="sidebar" node. Notice how this one gets every <li> element inside the node with id="portal-globalnav" in Plone, and makes a copy inside the node that has id="main-nav" in the theme. Removes the specified element if it exists. This one is a bit different than the others, since it only has a content=value - since it only makes sense to drop an element from the Plone side. Since there is no ID directly on this image, we just drop any <img> inside the user-name ID. That's actually everything you need to know, now the next steps are up to you! The XDV Reference contains code examples for breaking up a rules file into multiple files with xincludes(for the purpose of reuse) and using conditional statements in rules files. See Using EP with XDV Themes for examples of more complex configurations such as selecting themes based on URL or HTTP headers. Portions of this documentation were authored by Alexander Limi (Theming with collective.xdv) and Denys Mishunov (Advanced XDV theming).